[Muris] has a friend who is selling items on the internet. This friend wanted a simple way to make rotating images of the products and asked him to help. The result of his labors is this base unit that drives the turn table and controls the camera. The first iteration of the turntable was powered by the stepper motor from a floppy drive. A disc was mounted directly on the motor spindle, but the results were a bit poor. This is because the motor had a fairly low resolution of 200 steps per rotation. That doesn’t allow for smooth animation, and there was a lot of vibration in the system. An upgrade to the geared system you see above included swapping out that motor for one from an old scanner. Now it achieves 1200 steps per rotation and the vibration is gone. The connectors seen in the base are USB, incoming power, and shutter control. [Muris] wrote a program to control the PIC 16F628A inside the base. The program sends commands via USB and has parameters for number of frames per rotation, direction of rotation, and the like. Set it up as desired, place the product on the turntable, and hit start. Unfortunately there’s no video of this in action because [Muris] gave it to his friend as soon as it was finished. We guess the fact that he didn’t get it back means it’s working great. If you don’t mind some rough edges and exposed wiring you can throw a system of your own together pretty quickly. 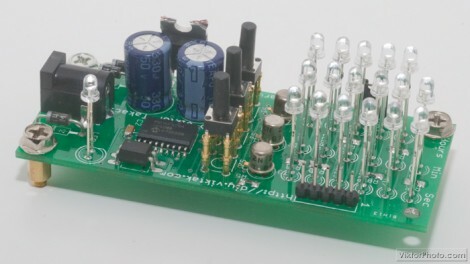 Building a capacitance meter is a great exercise. If you’re feeling quite safe in your digital-circuit-only life, this will push just far enough out of the comfort zone for you to see there’s nothing to fear in adding analog circuits to your designs. Here, [Raj] compares a voltage divider and RC timer to calculate the value of a capacitor. The project is aimed at teaching the concepts, and will be easy to follow for anyone who has at least a bit of experience working with a programmable microcontroller. The meter is based on an established equation that uses are starting and ending voltage, as well as the time it took to transition between the two, to calculate capacitance. 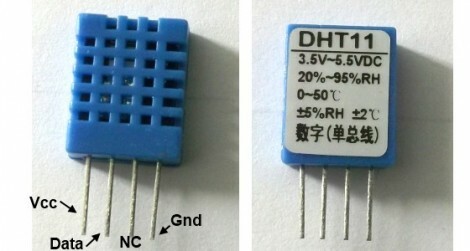 The capacitor will be charged from 0 volts to 0.5 volts. Using the built-in analog comparator is the easiest way to do this. [Raj] breadboarded a voltage divider to establish a 0.5V reference on one of the comparator’s pins. The other input comes from a circuit that places a resistor in line with the capacitor being tested. When that reading rises above the 0.5 volt reference the comparator match will be tripped, stopping a timer that had been running during the charge cycle. From there it’s just a matter of using the timer value in the calculation. Here’s a three digit binary clock that [Viktor] designed. 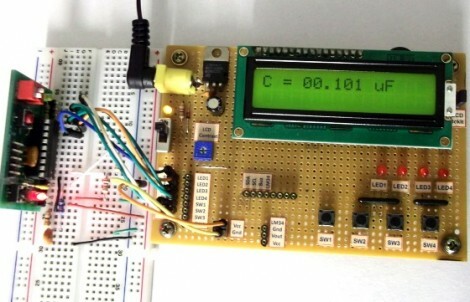 It uses a multiplexed display to drive one digit at a time with a PIC 16F628A. The video after the break shows it ticking away, display hours, minutes, and seconds in blue LEDs. You may be wondering why those LEDs are not flush to the board? [Viktor] took the project one step further than most binary clock projects, designing a PCB to fit into the enclosure of an old laptop PSU and then having the board manufactured. With options like DorkbotPDX groups orders its has become quite inexpensive to do this and it’s really good practice for when you need to design a highly complicated board for that super-fantastic project of the future. This wristwatch circuit board has some pretty interesting digits. They’re older components that give a classic look to your wristwatch display. On board you’ll find a PIC 16F628A running with an external clock crystal. The display isn’t always illuminated (kind of like Woz’s watch) in order to save the batteries, but can be woken up for a short time with the push of a button. The steam-punk-ish body seen to the left is the just first try. This guy has four more boards left so it should be fun to see what he comes up with. This alarm system senses motion and then alerts you by phone. [Oscar] had an old external modem sitting around and, with some wise hardware choices, he came up with a simple circuit to use it. First up is the PIC 16F628A chosen because it doesn’t require an external crystal. This connects with the modem via a DS275 RS232 transceiver because it requires no external parts for connection. The final portion of the puzzle is a PIR sensor that triggers a pin interrupt in the sleeping PIC, which then dials your number to alert you. It doesn’t look like anything happens other than your phone ringing, but that’s enough for a simple system. 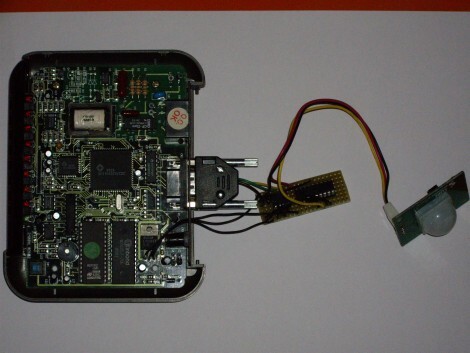 We’re just happy to see how easy it was to use that modem… time to go hunting for one in dreaded junk trunk. Don’t miss the clip after the break.